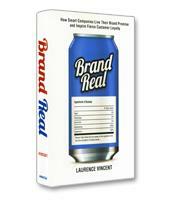 Brand Real is a business strategy guide for making a brand’s promise stand up at every customer touch point. Packed with proven, repeatable management practices, the book shows how to establish a clean brand architecture while avoiding the needless complexity that has tripped up many promising companies. One afternoon, brand consultant Laurence Vincent asked a potential client a few simple questions, including: How indispensable is your brand to your customers? What does your brand do better than any competitor, and why does it matter? If your brand disappeared tomorrow, why would anyone care? "On this particular occasion, his answer stunned me," writes Vincent in his book Brand Real: How Smart Companies Live Their Brand Promise and Inspire Fierce Customer Loyalty. "He said, ‘I’m not looking for a management consultant. I’m talking to you because I need a nice new brand to make up for the problems you just asked me about.’ And there it was: the trouble with modern branding..."
The trouble, according to Vincent, is that companies with deep core problems believe that all their problems can be solved with a new name or logo. In the case of this potential client (who never became a client), the company’s differentiating strategies consisted of aggressive pricing and cost-cutting, instead of adding value. In short, the company was a mess. No worries, thought the CEO, I’ll just hire a brand consultant to "design a better logo, tidy up the Web site, and clean up the advertising," Vincent writes. "That’s not branding. That’s stagecraft." Real branding is not about cosmetics, writes Vincent. It’s about making a promise and then delivering on it. As Vincent explains, branding works because of how the brain operates. A human brain is required to process much more data than anyone could possibly consciously process themselves; as a result, it relies on cues connected to a series of expectations, which, in turn, causes automatic (without "thinking") reactions. A red octagonal sign automatically causes you to stop because you know what to expect and what to do. If someone put the word "Go" in the middle of a red octagonal sign, you would probably still stop. That is how brands work, Vincent writes. They cue your mind to expectations of a benefit. According to Vincent, the expectations or "benefit" of a brand can be grouped into six common strategic themes, including Access, such as low prices, extra hours or multiple locations; Features and Functions, which refers to differentiation through the best and/or most features; and Approach, or how the benefits are created — for example, a company that emphasizes its products are not outsourced is following an approach-driven brand strategy. The final three benefits are the Personality of the brand, the Cause or moral purpose attached to the brand and Lifestyle. Lifestyle brand strategies are the most common because they speak to a consumer’s aspirations. Brand strategies are just one of the topics covered in Brand Real. Other topics include how to make brands memorable and how to create a brand architecture — the careful organization of brands and sub-brands that allow room for growth but without, in Vincent’s words, "sacrificing the essence of the brand’s bond with customers." One chapter also explores the mind of consumers and how they attach their identities to brands. Through its detailed frameworks, succinct and relevant case studies, and its focus on aligning brand strategy to business practices, Brand Real explains how to harness the full potential and power of successful branding. No reader will mistake branding for stagecraft.